I can’t believe another week has flown by at lightening speed! Where did it go? Earlier in the week, I did get a chance to use the HQ mid-arm machine that a local quilt shop rents to quilt my Wild Goose Chase quilt. I’m sewing on the binding at the moment. Next week I’ll show you the whole enchilada. But this week: Liberated Wedding Ring blocks. This is for the novice foundation paper-piecer. These are probably one of the easiest blocks on which to practice this method. 1. 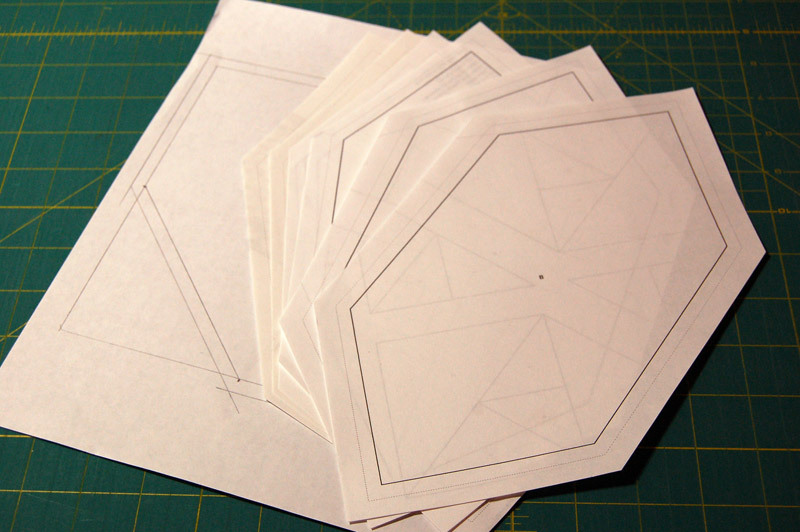 Decide what size block you want to make and draw a square on some scrap paper. Mark the half-way point on each side of the square. I am making 7-inch blocks and half-way would be 3 1/2 inches. Draw diagonal lines from the top to the right side and from the left-side to the bottom to create that weird kite shape. Then add 1/4-inch seam allowances all the way around. 3. 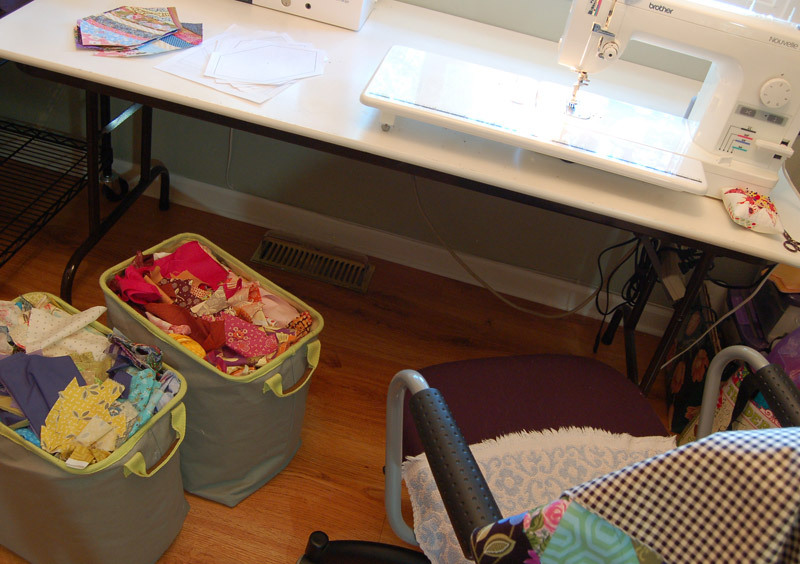 Set up your scrap baskets near your sewing machine so that you can dig for just the right piece. I’m not digging too far down; just choosing what seems to be good from the top layer. I could dump them all over the floor to really dig, but it’s such a mess to clean up if I’m not going to sew for very long. Then the cats think that the scraps on the floor are a comfy cat bed made just for them. 4. 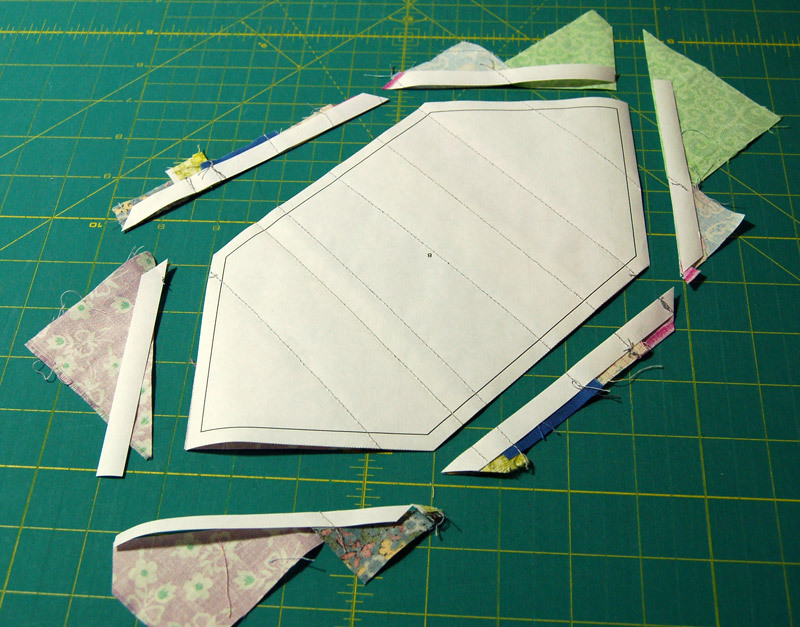 Lay the first piece right-side-up on the back side of your template. Lay the second piece right-side-down and stitch along the edge. I usually shorten my stitch length a little bit so that the paper tears off easier without messing up the stitches. 5. If necessary, fold back the paper along the seam line and trim away any excess fabric leaving a 1/4-inch seam allowance. Press the fabric open and place another strip right-side-down along the edge of the second piece. 6. Continue sewing strips on each side of the template until it is all filled up. 7. Flip the template over and trim away the excess paper and fabric with a ruler and rotary cutter. 8. Keep making blocks until you have the desired quilt size. When you are ready to assemble the blocks, carefully tear away the paper on the back side of each block. 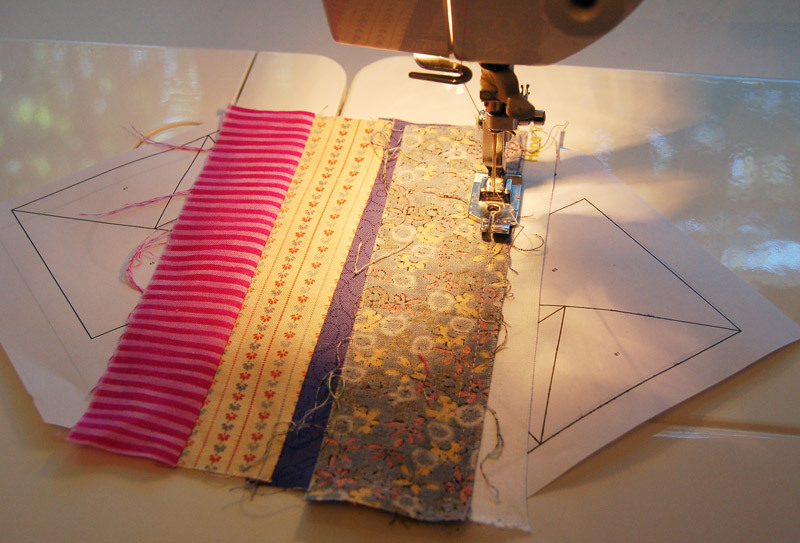 Now, we have to sew triangles to each side to make the blocks square. 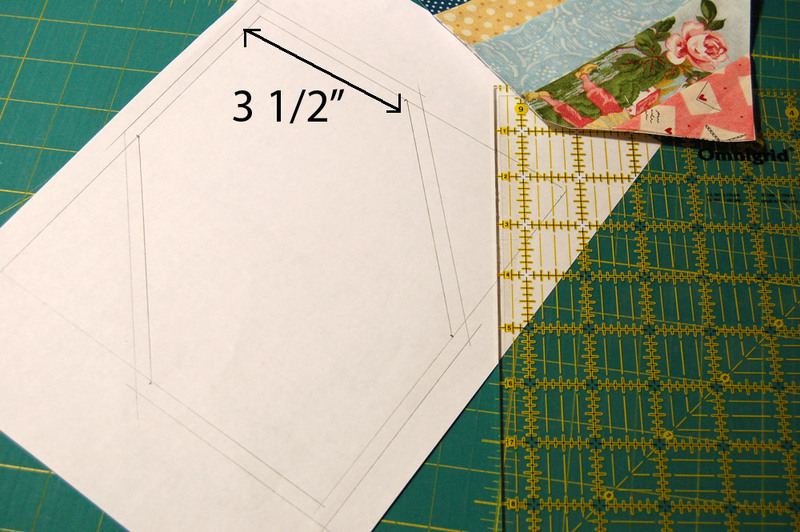 My blocks are 7″ finished, so this is how you would work through the math to calculate your triangle size. Remember back at the beginning, the half-way mark was at 3 1/2-inches? Theoretically, I want 3 1/2″ half-square triangles sewn to those corners. 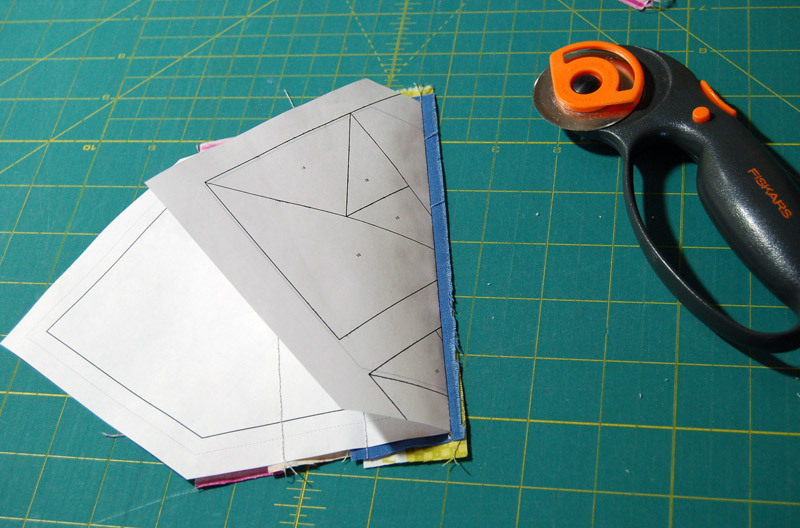 To make half-square triangles we add 7/8′ to the finished size to accommodate cutting the squares in half. So, my white square needs to be 4 3/8-inches, cut in half diagonally once to complete each block. (3.5 plus .875 equals 4.375) I just cut up some scrap white fabric so that you can see where these would be sewn. I’m not yet sure what fabric I’ll use to complete the blocks. 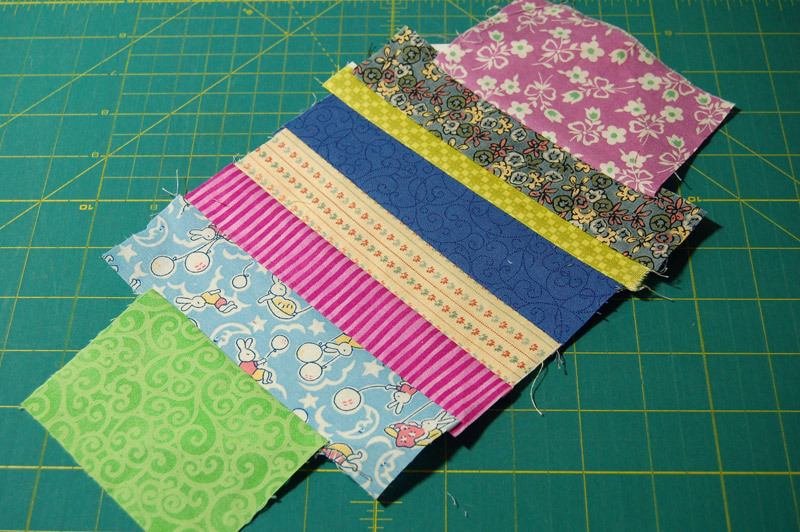 Right now I’m concentrating on just using up my scraps. If you were making a 10-inch block, half would be 5 inches… add 7/8-inch for cutting it in half and you will want to cut a 5 7/8 square to complete each block. Does this make sense? Let me know if you are having trouble with the math. I hope you found this beginning foundation paper-piecing tutorial helpful. And… if you want to sew along with me… I’ve created a Flickr group where you can add your photos and ask questions or chat away about the Liberated Wedding Ring quilt you are making. And since I never did make a Flickr group for the Wild Geese quilt you can add those photos there as well. Any quilt-along or tutorial from my blog can be shared in this group. That makes it look so simple and straightforward. Thanks! Does your local quilt shop teach long arm quilting classes by any chance? I would really love to learn how someday! i just love love LOVE this block! i was thinking i needed a good string quilt project. you are going to make it easy for me to start a new beauty. thanks for your tutorial and inspiration!!!! FUN!! I have a bunch of string squares in progress, and this looks like a fun way to play. « What did you do over the weekend? 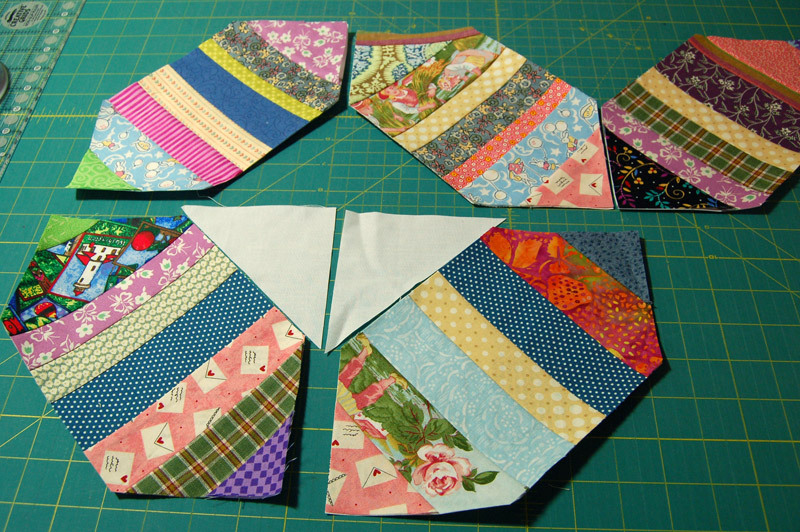 You are currently reading Foundation Paper-Piecing 101 at Bloomin' Workshop.